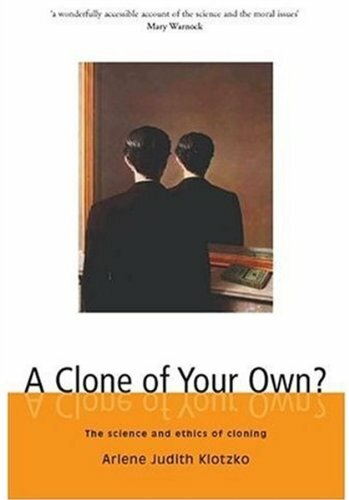 Describing the new world of possibilities that can be glimpsed over the horizon, the author explains that the technology to create clones of living beings already exists, inaugurated in 1996 by Dolly the sheep, the first mammal cloned from a single adult cell, and shows why the prospect of human cloning triggers our hopes. Someday soon, if it hasn't happened in secret already, the first cloned human will be born and mankind will embark on a scientific and moral journey whose destination cannot be foretold. In "A Clone of Your Own" , Arlene Judith Klotzko describes the new world of possibilities that can be glimpsed over the horizon. In a lucid and engaging narrative, she explains that the technology to create clones of living beings already exists, inaugurated in 1996 by Dolly the sheep, the first mammal cloned from a single adult cell. Dolly was the culmination of a long scientific quest to understand the puzzle of our development from one cell into a complex organism - the outcome of a ' fantastic experiment' envisioned six decades before her birth. Scientists have since cloned mice, cows, goats, pigs, rabbits, horses, rats, a cat and a mule. Using the same laboratory tools and techniques, other researchers are trying to grow embryos, cloned from a single cell of a human being. Their goal is not to make copies of existing people, but to derive stem cells, the infinitely malleable raw material from which they hope to design therapies for currently untreatable diseases and the afflictions of old age. Our fascination with cloning is about much more than science and its extraordinary medical implications. In riveting prose, full of allusions to literature, psychology, art, music, and the cinema, Klotzko shows why the prospect of human cloning triggers our dearest hopes and especially our darkest fears, forcing us to ponder anew what it means to be human. And what it would be like to have 'a clone of your own'.